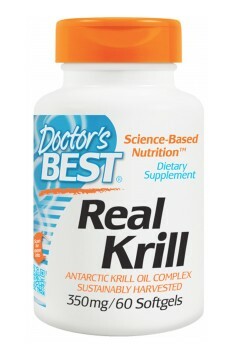 Doctor's Best Real Krill is a dietary supplement containing an oil from Antarctic krill. It's the purest form of easily digestible forms of omega-3 acids, essential for the proper functioning of the heart and the entire cardiovascular system. Antarctic krill (Euphausia superba) is a small crustacean dwelling in the sea, similar in its structure and appearance to shrimps. These organisms live only the cleanest waters on earth, mainly Antarctic waters, outside the influence of unfavorable industrial environment, which is why the oil of them is devoid of harmful substances. The Antarctic krill oil contains a complex of phospholipids with omega 3 acids and astaxanthin. The most positive attributes of the krill oil is the presence of inhibiting oxidation of astaxanthin omega-3 acids, and exhibiting generally a high biological activity, the binding of omega-3 and astaxanthin into complexes of phospholipids, facilitating their absorption from the gastrointestinal tract and distributed to the tissues. Phospholipids, to be well processed they must be associated with the appropriate type of fat. Such a fat is omega-3 acid (DHA and EPA). For standard fish oils, omega-3 fatty acids are present as triglycerides or ethyl esetrs. In the krill oil, omega-3 acids form a complex with phospholipids, which are essential structural components of all living cells, and are part of cell membranes. The Krill oil (as the fish oil) is a rich source of unsaturated omega-3 fatty acids and has the most readily absorbable form – fully soluble in water, and therefore are easily digested. These acids include improve concentration, they beneficially affect our mood, and on lowering "bad" cholesterol. Studies have shown that fatty acids of krills are characterized by a slow and steady increase in their blood level, sustained even for up to 12 hours. There is also a significantly increase in their use in the organism. An additional advantage of the krill oil is the presence of natural astaxanthin in its composition – one of the strongest known antioxidants. It removes free radicals, which are the cause of many negative processes in the body. Free radicals oxidize, among others things, bad cholesterol. It is created then, so called, a form oxy-LDL, that is associated with an increased risk of developing atherosclerosis, or coronary heart disease. The efficacy of astaxanthin and its advantage over the other antioxidants is due to the fact that it is integrated in the cell membrane protecting the structure from both sides. Thanks to its unique structure, it protects the cell membrane phospholipids, and other lipids in the body, from damages due to oxidation. Apart from its beneficial action for the heart and the circulatory system, astaxanthin exhibits a number of other health-promoting properties – including enhancing the level of eye protection, preventing aging of the skin, and increasing protection against UV radiation. Many studies have demonstrated that omega-3 acids are characterized by anti-inflammatory and analgesic properties, so they can help in the case of osteoarthritis, or joint pain in athletes. The anabolic properties of the fat of marine organisms have been known in folk medicine for hundreds of years. Until recently cod-liver oils of fishes were used in the treatment of underweight in children, and adolescents. Already in the above-cited study Couet observed following supplementation with omega-3 decrease body fat while increasing lean body mass or muscle tissue. In summary, the preparation Doctor's Best Real Krill is a source of essential omega-3 acids; DHA and EPA in other forms than bioactive preparations from the fish oil. It improves the level of functional efficiency of cells, by optimizing the structure of the cell membrane. It supports healthy structure and the functioning of the brain, blood circulation, joints and other organs. Krill oil is rich in valuable omega-3, all enclosed in one capsule. We often hear that it's worth to eat fish, precisely because they contain omega-3. On the other hand, there are also the news about the water pollution that makes fish food worthless, almost malicious. Antarctic krill live in only the cleanest waters, so the oil obtained from this crustacean is an ideal way to ensure the optimal dose of essential fatty acids that is omega-3. it's worth to take between 1 to 3 capsules per day, with a meal. Product that helps to improve the overall performance, speed recovery, increase muscle mass and strength. A multi-conditioner to use before workouts. Increases strength and endurance. Pre-workout stmulant. Boosts endurance. Extreme energy. Formula with strong cardioprotective and hepatoprotective properties. Antarctic krill oil – a top-quality source of omega 3 acids, and eicosapentaenoic and docosahexaenoic acid which may be involved directly in metabolic pathways in the human body. This makes the krill oil a better source of omega 3 than plant sources, such as flax oil. In addition, krill oil is indicated to be one of the least polluted animal sources of EFAs and has a perfect ratio of omega 3 to omega 6. Adequate intake of essential unsaturated fatty acids is crucial to the maintenance of cardiovascular health. It can optimise the lipid profile and helps maintain normal cholesterol levels and HDL-LDL ratio. Supplementation with omega 3 acids aids also in lowering triacylglycerol levels. Furthermore, adequate dietary intake of EFAs promotes a healthy nervous system and delays ageing of the body. Omega 3 acids are also believed to be capable of regulating blood pressure and show anti-inflammatory activity. Krill oil is characterised also by the content of other health-promoting substances, such as phospholipids, choline and astaxanthin. This enhances the effectiveness of this product and places it at the forefront of supplements which help maintain the body’s optimal health.